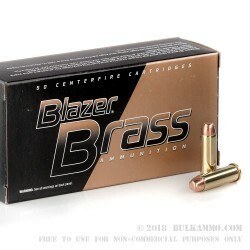 Blazer Ammunition is a line of CCI and is owned by the ATK manufacturing corporation. 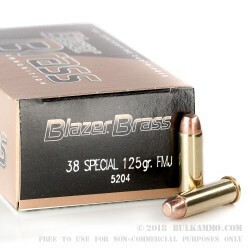 Blazer is well known for producing reliable and affordable ammunition for American shooters. This .38 SPL 125 grain FMJ ammo is perfect for plinking, training and competition with your .38 revolver. 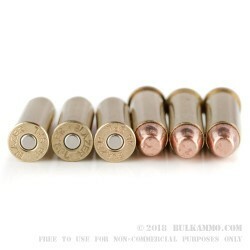 Ammunition is true copper over lead and all bullets are loaded into brass, fully reloadable casings. Muzzle velocity is 865 feet per second and energy is 210 foot pounds. 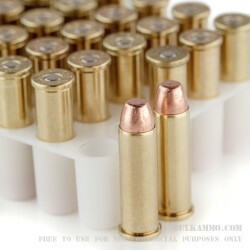 Brass casings are fully reloadable and boxer primed.